Today is the eleventh anniversary of my marching across stage to officially end the formal student phase of my life. Around 2 pm, I shook hands with the president of Carnegie Mellon University and the Dean of Humanities and Social Sciences to accept my PhD in History. It could’ve and should’ve been a joyous moment, but it wasn’t. After all, I had learned that my mother was about as happy for me as some of my former fellow grad students, who threw around words like “envious” and “jealous” in the year before my official graduation. I tell this story in Boy At The Window this way: “The proverbial someone once said that a picture is worth a thousand words. But…even in the age of megapixels, pictures miss what words can say. 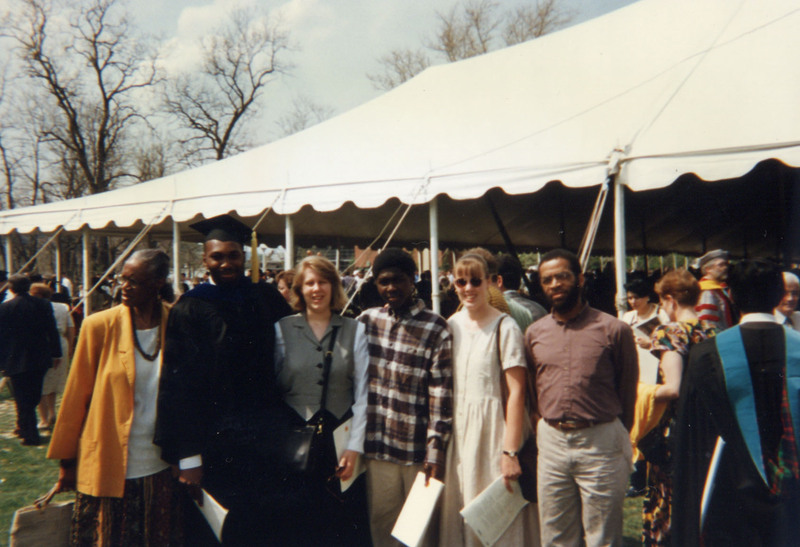 Such is the case with a picture of me and my closest folk on my PhD graduation day in May ’97. On this sultry and sunny spring day, I stand in my polyester black cap and gown with my future mother-in-law dressed in a yellow-gold blazer and flower-print skirt on my right, and my longtime high school friend on my left. My friend’s one-time ‘surrogate’ son and her twenty-three-year-old sister, as well as my graduate-school friend and colleague Ed are also in this picture, from my friend’s left through the rest of the four-by-six-inch print. They all look hot and happy, as if they went through the doctoral thesis process in one afternoon. At the least, they looked ready for air conditioning or shade. I’m happy too, if only for that moment. The Carnegie Mellon University-wide ceremony was anticlimactic. I’d finished my dissertation with approval from my committee six months before I marched across stage. Yet I had reason to smile the smile of relieved happiness. Relieved that the outdoor graduation ceremony had concluded and happy to see my then girlfriend Angelia grinning ear-to-ear as she snaps the picture of the six of us. Noticeably absent from this picture is my mother, who stood outside of our huddle (to the right of Angelia’s mother). If you look closely at the picture, you can see Ms. Levy gesturing—presumably to my mother—to get her into the picture. What you don’t see is my mother shaking her head and looking at the rest of us with discomfort as we set up for Angelia’s shot. What you also don’t and can’t see is the pride that everyone involved in the picture possessed about my accomplishment. It was an almost overwhelming experience to receive so much emotional support after so many years without it. But pictures, no matter how well orchestrated, only capture a moment in time, a moment that could be connected to a string of events or an off-the-beaten path tangent from events already in motion. Or a picture can be a snapshot of a transition point between events. For all of us, I think, this picture symbolized major turning point in our lives, ‘the way we were,’ if you will. My relationships with my mother, my soon-to-be mother-in-law and wife, and my friends all changed or were in the process of change. Angelia’s picture captures the dark mood that my concrete expression struggled to show. I privately acknowledged that my mother had never cared about my degree or other accomplishments because I somehow was ‘showing her up.’ I had worked for nearly fifteen years to make this moment in my life happen, a moment where my dreams, my ultimate make-believe fantasy life had finally begun to merge with 3-D reality. Then my mother had decided at the last minute to catch an earlier flight. And just as my individual, Department of History celebration was about to start. To say that my reasonably close—sometimes too close—relationship with my mother hasn’t been the same since would be like saying Hiroshima was never the same after the Enola Gay unloaded her deadly payload. She needed to go to the airport for her flight to take care of ‘the kids’—my four younger siblings. ‘The kids’ were between thirteen and eighteen years old, and had been without my mother’s supervision for two full days before her airport request. During the trip to the airport in my graduation robe, I thought about crying, yelling, even about shaking my mother to see if she could show any emotion other than a blank disdain. I chose instead the most uncomfortable silence I could summon. When we arrived at the gate, I finally said to her that she had ‘ruined every event in my adult life’ that I had given her the opportunity to attend. And this was the first opportunity my mother had taken advantage of—she couldn’t get to my other graduations because neither of us had the money to pay for her transportation. I certainly understood that reality, because I grew up in it. This was different. This was telling me that even if money weren’t an issue, my mother wouldn’t have been able to show any sense of pride or joy in what I had done. The irony of that fateful day was that my mother’s six o’clock US Airways flight was delayed more than two hours due to thundershower activity in Pittsburgh and New York. It was after eleven by the time my mother arrived home, according to one of my brothers. What I don’t discuss in the manuscript are other details to this week eleven years ago. Including the fact that I was living on four or five hours of sleep for a week and a half. That I started the week of my Carnegie Mellon graduate in New York interviewing for an assistant professor job at Teachers College. That my mother marched for her associate’s degree at Westchester Business Institute in White Plains five days before my graduation, and that her comment to me about my years of working on a second high school diploma came the day after her graduation ceremony. What I don’t talk about is how my mother and eventual mother-in-law, in their first-ever meeting during my mother’s time in Pittsburgh, spent three hours discussing their failed marriages and the horrible nature of Black men the day before my graduation. And finally, that for the next four days after my graduation, I had a severe gastrointestinal infection, no doubt made worse by my sleeplessness and emotion distress. The last eleven years have been a struggle to have a career as satisfying and as successful as my post-high school academic experience, with many more positives than negatives. At the same time, my struggles in career and in my life in general are the reason that I find myself in constant self-reflection about my life. It’s this self-reflection that helped me in writing Boy At The Window in the first place. But the most difficult aspect of the things that I do struggle with centers on trust. Between my mother and my former advisor, not to mention some of my former fellow grad students and others on my dissertation committee, I felt a sense of betrayal that I hadn’t felt since the day my stepfather had knocked my mother unconscious. It took about a year and a half for me to recover from the dissertation process and from what my mother did during my graduation weekend. I certainly was sarcastic before, but I know that I’m jaded about trusting others these days. Especially folks in positions of authority who happen to be somewhere between flighty and absolute fakes. Some people I’ve worked with in publishing come to mind. Others I’ve worked with and for, though, are far more typical in my world of being careful with whom I divulge my information and life experiences to. Most of time, I find myself much more deliberate about the company I keep and the folks I talk to about my world beyond my job, my teaching and my writing. I’ve had to learn a second time how to overcome betrayal and distrust. The first time, I could almost trust anyone. This time, I have much more choice as to whom I trust and for how long, which also makes it all the more difficult. As for my mother, I have long since forgiven her for the things that she did and said eleven years ago, although I have to work hard at standing in that forgiveness sometimes. But with my memory, in which I can tell you what I had to eat for dinner on May 12th of ’97, it’s hard to forget.